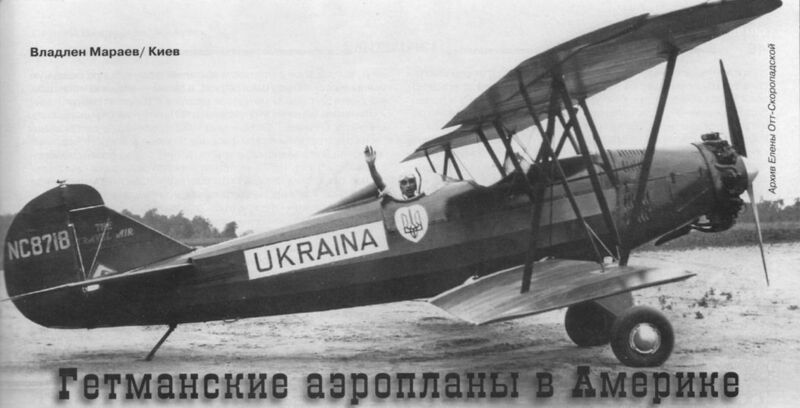 Компания "Travel Air Manufacturing Company" была образована в Уичите, штат Канзас, в конце 1924 года такими известными в авиации личностями, как Уолтер Бич, Клойд Цессна и Ллойд Стирман. С такими конструкторами фирма просто обязана была занять достойное место ДальшеMore>>> в истории авиации. К сожалению, компания успешно просуществовала только до конца 1920-х годов, пока не разразился экономический кризис. В дальнейшем фирму поглотила компания "Curtiss-Wright Corporation". Первым самолетом фирмы стал спроектированный в 1925 году Travel Air 1000 - традиционный биплан с мотором Curtiss OX-5 мощностью 90 л. с., рассчитанный на перевозку двух пассажиров в открытой кабине; летчик был размещен в задней открытой кабине. Travel Air 2000 отличался от предшественника рядом конструкционных изменений и увеличенной дальностью полета. Самолет массово строился до 1930 года в нескольких вариантах: SC-2000 (160-сильный мотор Curtiss C-6), Travel Air 3000 (150- или 180-сильный мотор Hispano-Suiza Model A или Model E), Travel Air A-4000 (150-сильный мотор Axelson), B-4000 (220-сильный мотор Wright J-5), BC-4000, гидросамолеты SBC-4000 и C-4000 (170-сильный мотор Challenger), E-4000 (165-сильный мотор Wright J-6), K-4000 (100-сильный мотор Kinner K5), W-4000 (110-сильный мотор Warner Scarab), B9-4000 (300-сильный мотор Wright J-6-9), Travel Air 8000 (120-сильный мотор Fairchild-Caminez), Travel Air 9000 (125-сильный мотор Ryan-Siemens), Model 4D (225- или 240-сильный мотор Wright J-6) и последний сертифицированный вариант - Model 4P (140-сильный мотор ACE La.1). Силовая установка: один мотор воздушного охлаждения Wright J-6 мощностью 165 л. с. IN order to meet an exceedingly popular demand that exists in America for a small, medium-powered machine, for fast passenger or express-carrying cross-country work, several of the aircraft constructing firms in America have concentrated their efforts in this direction. One such machine, described herewith through the courtesy of our American contemporary, Aviation, is the "Travel Air Special," which put up an excellent performance in last year's Ford Reliability Aeroplane Tour. 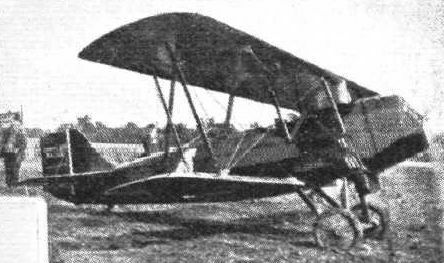 This machine, which is produced by the Travel Air Manufacturing Co., of Wichita, Kan., was designed by Lloyd Stearman and MacShort, engineers of the company. Perhaps one of the most interesting, and certainly very significant, features of the design is the fact that the designers have kept their production within strict accord with the specifications laid down by the Aeronautical Safety Code. It is worthy of note that six weeks after the decision was arrived at by the executives of the company to construct the machine, it had been flight tested and entered in the Air Meeting held at Tulso, Oklahoma, during the first week of September last. As an example of rapid construction of an entirely new design, the accomplishment is remarkable, especially when it is recalled that production of the standard model was not licensed during this period. In some respects the "Travel Air Special" possesses several of the characteristics of the standard OX model produced by this firm. The fuselage is of welded steel tubing with bracings of tubing and wire. The engine mounting, also of steel tubing, is made a detachable unit. The wings are of wood and fabric construction with box spars and built-up ribs, and interplane bracing is secured by X struts of streamline steel tubing, together with streamline bracing wires. The upper plane, which is larger in span and chord, is straight, and is supported above the fuselage by two pairs of X struts. It is in three sections - two outer ones attached to a small centre panel. The ailerons, mounted in the top wings only, are operated by the standard Travel Air method of push and pull rods carried in the lower plane, thence through bell cranks and aileron struts. By this means the elimination of pulleys in the control system has been made possible. The tail surfaces are of steel tubing and stamped steel ribs, the horizontal surface being adjustable as to incidence from the cockpit - a refinement, desirable, but not usually found on machines of this type. A total seating capacity for four persons is provided on this machine, the rear cockpit being very large, with dimensions, that permit the seating of the pilot and a passenger. The controls are so arranged that they can be off-set to allow for the lateral shifting of the pilot's position. The forward cockpit - located at the trailing edge of the top plane - seats two persons, and entrance to it is effected by a convenient door in the fuselage. If required, this cockpit can readily be converted into an express goods or mail compartment of 22 cub. ft. capacity. Furthermore, if dual control is desired, forward cockpit controls can be installed quickly. Luggage is accommodated in a compartment located directly back of the pilot's cockpit. 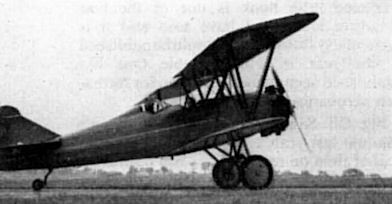 A Curtiss C 6A (160 h.p. at 1,750 r.p.m.) engine is installed, well cowled in. A free air radiator is mounted under the engine, and water temperature is controlled by retracting the radiator into the engine compartment and shuttering the exposed surface. The cleanness of design throughout is apparent from the accompanying illustration - the streamlining of the landing gear and exposed fittings having been carried out in detail. The excellent performance of the "Travel Air Special" has been demonstrated at the Tulso meeting, and in the Ford Reliability Tour. 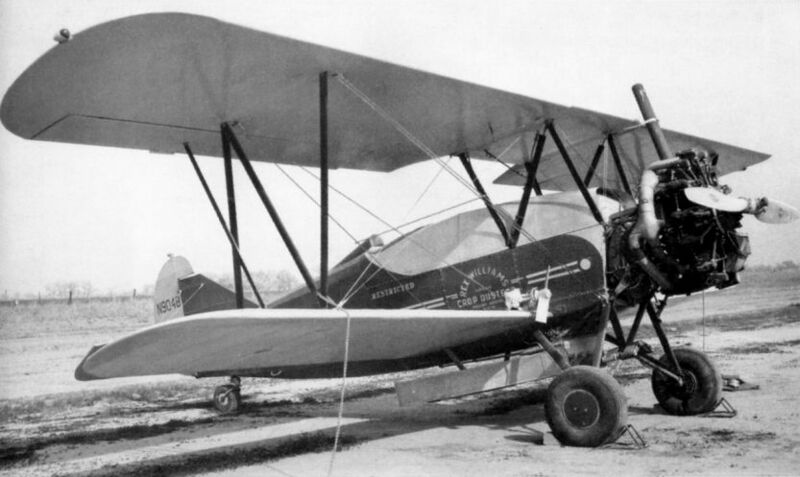 Walter Beach, manager of the Travel Air Co., piloted the machine in these events, and it may be mentioned that this was one of three Travel Air machines that finished the Ford Tour with a perfect score. Span (top) 31 ft. 6 in. Span (bottom) 25 ft. 2 in. Chord (top) 5 ft. 0 in. Chord (bottom) 4 ft. 0 in. Height 8 ft. 8 in. Total wing area 240 sq. ft. Weight of pilot, fuel, oil, &c. 582 lbs. Normal pay load 500 lbs. Weight, fully laden 2,542 lbs. Weight, per sq. ft. 10-6 lbs. Weight, per h.p. 15-9 lbs. Cruising range (100 m.p.h.) 5 hours. 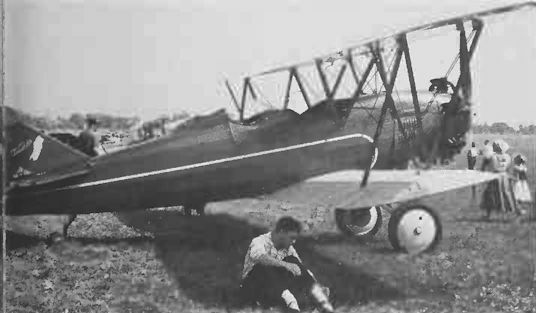 THE "TRAVEL AIR SPECIAL": An American four-seater commercial biplane, fitted with a Curtiss C 6A 160 h.p. engine. THE FORD RELIABILITY TOUR: Some of the competing machines which took part in the 1,900-mile reliability air-tour in America for the trophy presented by Mr. Edsel B. Ford. (2) The Travel Air. HARVARD UNIVERSITY FLYING CLUB: (No. 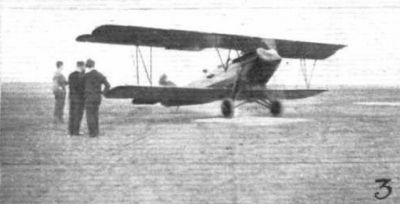 3) The new Travel-Air biplane fitted with a Curtiss O XX6 (100 h.p.) engine, now used, which was obtained this summer by the members when an opportunity arose of disposing of the old machine advantageously. HARVARD UNIVERSITY FLYING CLUB: (No. 2) The first machine that the members used and owned. It is a Travel-Air biplane. Heroes of the front line - as long as the front was near Hollywood. As the studios continued to make films with the first war in the air as a backdrop, attrition began to take its toll on the poorly-maintained original World War One-vintage aircraft frequently called into filming duty, and many were either wrecked or grounded owing to lack of airworthiness. When Hollywood sought replacements (if they were looking for the least bit of accuracy), the biplane of choice came from Travelair, based in Wichita, Kansas. 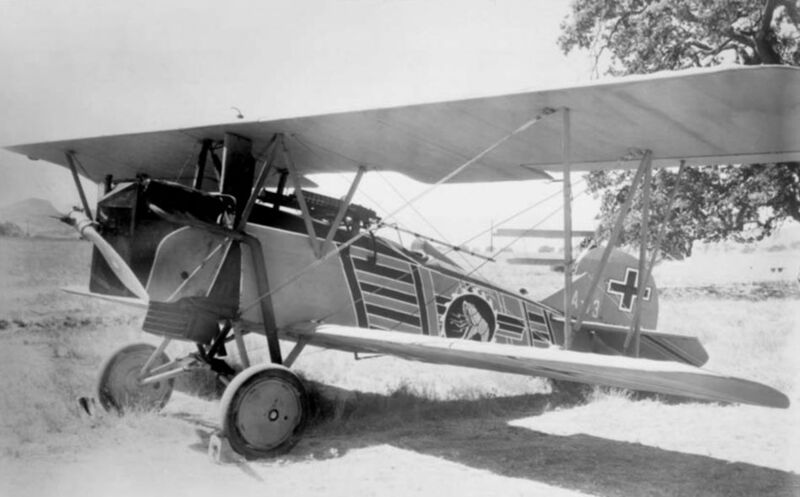 Travelair aircraft indeed owed much to Germany’s Great War veteran, the Fokker D VII; both had a welded-steel-tube fuselage and N-struts, and with a few minor modifications, the “Wichita Fokker” proved to be an effective stand-in for the real thing. Самолеты семейства Travel Air 4000 близки серии Model 3000, но вместо моторов жидкостного охлаждения на них стояли звездообразные двигатели воздушного охлаждения, обеспечившие лучшие летные данные. 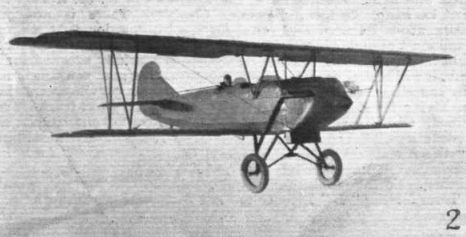 Travel Air biplane of 1929. On the left, a Travel Air "4,000" about to leave for Quebec with passenger and luggage. Right, another Travel Air machine at St. Hubert Airport, with the Airship mooring mast in the background. The fleet of Travel Air monoplanes and biplanes lined up in front of the Government hangar at St. Hubert Airport.